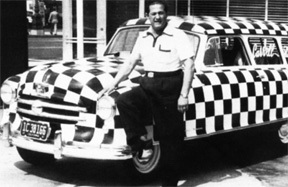 According to the popular version of the sport’s origin, stock car driver Larry Mendelsohn is credited with organizing and promoting the first true demolition derby, in Long Island, New York, in the late 1950s. However, there are accounts of earlier events, and one of the most interesting questions on the origin of the sport comes from none other than the Merriam-Webster’s Collegiate Dictionary, 10th edition. Demolition derby: n. (ca. 1953): a contest in which skilled drivers ram old cars into one another until only one car remains running. At issue: the Merriam-Webster’s Collegiate Dictionary definition indicates the term was in fairly common use well before the late 1950s, when demolition derby is generally believed to have begun. 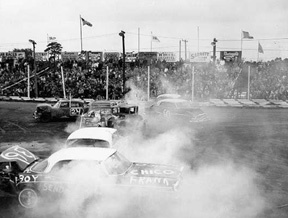 In order for the term to be commonly understood by 1953, there must have been a significant number of demolition derbies around the country prior to this time. This is especially noteworthy in light of limited national media coverage of sports in those days. The World Series or a heavyweight championship fight would have received national coverage but certainly not a demolition derby at a county fair. Thus, it must have taken some years prior to 1953 for the term to enter into common usage by word-of-mouth or local newspaper accounts. The best-documented account of another early event comes from Kevin Baxter’s article “Going to Wreck and Ruin,” in the December 22, 1999 Los Angeles Times. 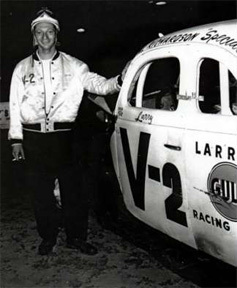 Baxter’s account describes West Coast racing promoter Don Basile’s 1946 staging of a “full-contact” race among four drivers at Carroll Speedway in Gardena, California. In Basile’s event the participants’ cars were secretly rigged to disintegrate upon impact. Purists may argue that the event was in fact a race and not a true demolition derby, in which the sole objective is to smash and disable the competition. Interestingly, the description of Basile’s event sounds very similar to what has become the popular sport of “Banger Racing” in England as well as in several other European countries and Australia. In British and European banger racing, cars race around a track for a designated number of laps, as in traditional auto-mobile racing. However, in banger events, drivers attempt to disable one another by crashing in to opponents or running them off the track. This type of competition is knows as enduro racing in the United States. At the conclusion of many banger events, all cars in running condition participate in an American-style demolition derby, in which the winner is the last car able to move. Following his 1946 event, Don Basile went on to be a successful promoter of traditional races as well as demolition derbies for the next five decades. One of his more memorable events was held in 1972 at the Los Angeles Coliseum, where he promoted a nationally televised demolition derby involving Indianapolis 500 champions A.J. Foyt, Mario Andretti, Parnelli Jones, and Bobby and Al Unser. According to Basile’s son Bob, a present-day promoter, the Indy champs not only smashed beautiful new cars, one of them destroyed Even Knievel’s donated Rolls Royce. 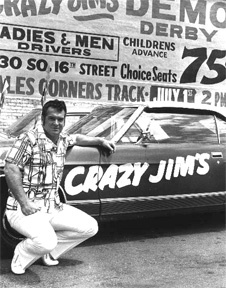 According to a Boston Phoenix article, in searching old county fair records, Todd Dube found that a used car dealer named “Crazy Jim” Groh promoted a demolition derby in Franklin, Wisconsin in 1950. The LA Times article by Kevin Baxter also mentions earlier derbies “springing up at county fairs during the Great Depression,” but offers no further explanation. Perhaps some day additional primary source information will come to light to explain the Merriam-Webster’s Collegiate Dictionary assertion that “demolition derby” was in common use by the early 1950s. Despite its uncertain beginnings, the sport’s popularity grew steadily throughout the 1960s, establishing a strong tradition as part of county fairs in rural communities and becoming identified as a quirky subculture on the national level. In the early 1970s, ABC’s Wide World of Sports, a weekly sports program with a vast viewing audience in the days before cable television, provided occasional national coverage of demolition derbies. Perhaps the best indicator the sport had “arrived” was when demolition derby became associated with Happy Days, one of the 1970s most-watched television sitcoms. 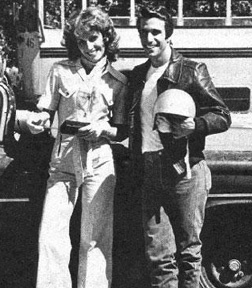 One of the Happy Days main characters, Fonzie, a loveable rebel without a cause, had an on-again off-again relationship with Pinky Tuscarado, a professional demolition derby driver. 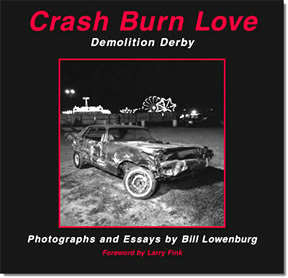 The plot line of three related episodes in the program’s second season revolved around demolition derby, demonstrating that by the 1970s the sport had entered mainstream consciousness. This excerpt is used by permission of the author and publisher. Daines, Robert. Email message to author 18 July 2004. Fuller, Todd. Happy Days Online. 2004. Sitcoms Online.